9mobile Nigeria has introduced its own black Friday on 9Estore. 9Estore gives customers additional extra 50% discount on any item purchase and of course, it also gives customers extra 15% discount when they recharge through their stores. 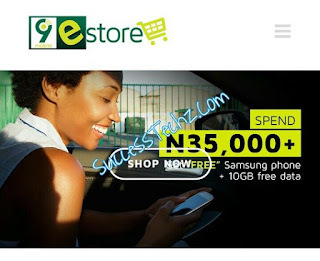 9mobile Estore has been launched this month, 9mobile Nigeria has to declare that any customers that purchase items up to 35k will be giving free Smartphone as a gift. apart from that, 9mobile also announced that users will be rewarded with free data for 1 year and also with free 10k airtime for calls. On 9mobile Estore, Customers can now purchase items like Android smartphones, wireless router, tablet, sim card, Data plans, Airtime and more. To get started click here to get started shopping on 9mobile Estore and get free Samsung phone plus free 10GB data for 12months. This is a welcome development from 9mobile,love to get more timely article on this great blog.